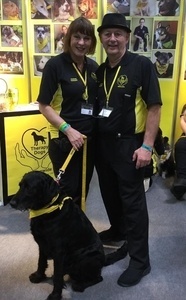 Did you meet Fiona & Steve at Crufts? They were two of the first volunteers to join TDN back in 2016. Fiona & labradoodle Inky have been visiting hospitals and residential homes in Bristol for many years. Once a year something amazing happens…Fiona & Steve both put on their super capes over their TDN uniforms and are true heroes. They live and breathe TDN for 6 days, yes that’s not a typo, 6 whole days. They are the first to arrive for the set up on the Wednesday and the last to leave on Monday after the stand has been dismantled. 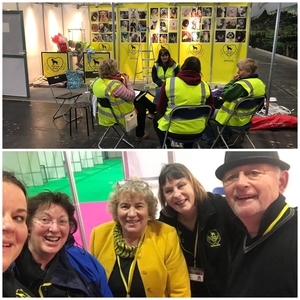 They are on the stand all day every day helping volunteers and potential volunteers with enquiries, keeping the trustees in order and most importantly, are at the front of the queue on the tea-run! And, when they are not helping on the stand, they are out with our partner exhibitors collecting for us.